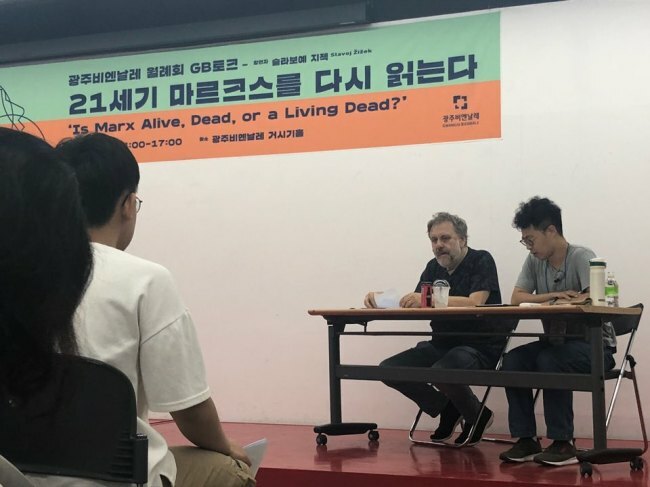 Slavoj Zizek, regarded among the leading intellectuals in the world, made his visit to a monthly gathering of the Gwangju Biennale to lecture on Marxism at the biennale’s conference hall in Gwangju. In the lecture titled “Is Marx Dead, Alive or Living Dead,” attended by some 200 people, Zizek talked about what people can do with Marxism in what he called a contemporary society ever-more disintegrated by increasingly permeating capitalism. Many topics and references were made during the lecture of some 2 1/2 hours by the Slovenian philosopher famous for making extensive use of simple examples, jokes and anecdotes accompanied by intellectual rigor on subjects ranging from Hegel, Marx and Lacan to Niels Bohr and others. According to Zizek, capitalistic societies are faced with problems now more than ever. “Capitalism is in crisis,” he diagnosed. “Capitalism is exploding in a sense of progressing, developing, but at the same time, more and more we live in an atmosphere of crisis,” Zizek said. Zizek said the issues are raised and deepened more so by triumphantly and ceaselessly developing technologies, unstoppable exploitation over nature, the coming of new social classes treated worse than conventional workers and long lasting antagonism between different civilizations -- to name a few issues. Can Marxism can offer the answer to solve problems that we have now’ Zizek said classical Marxism is no longer fully relevant to reflect on current issues. Is it a rosy future ahead for the left’ Zizekt seemed to say no. Meanwhile, “we the leftists are occupied with politically correct and high questions (yet) neglect so-called ‘ordinary people.’ To fight Trump is not to return to all liberal values, but we should learn from him,” he continued. Then what should we do’ Zizek said, “It’s not just we should act. Maybe the time has come to step back and think,” while referring to Fredric Jameson’s notion of “cognitive mapping.” Zikek could have meant that it is important to step back and think because people need moments of reflections, where they can realize sociopolitical conditions of their own lives and come up with better strategies to counter dynamics of capitalism. “I think we should repeat Marx, not repeat in a sense of doing the same but repeat in a sense of going back to Marx and doing it better in a different way than him,” Zizek suggested. Over the refugee issue that has just recently come to the fore in Korea, Zizek provided his own advice. “I think that the only way to confront this problem is to become aware of why are they coming here and how are we maybe complicit with them coming here.” According to Zizek, it is more important to realize the sociopolitical condition that has forced the people to immigrate now and also question whether we are responsible for them. “Yemen is having this terrifying civil war. Who is behind this war? It’s not Yemen people themselves. It’s a conflict between Iran and Saudi Arabia, and behind Iran and Saudi Arabia there are other superpowers. Russia is close to Iran and US is chained with Saudi Arabia,” said Zizek. A guest to Korea’s best-established biennale, Zizek also commented on art practices in capitalism. “For me, a good video game is more important than stupid high art. What forms our lives? (It is) narratives, how we tell stories. The way that they tell stories in video games is a mega change in our narrative strategy (and) how we experience our lives. This idea of alternate reality, this idea of multiple worlds that you can find this in video games is much more interesting than so-called ‘serious art,’” Zizek concluded.